In 2013 the previously little known blobfish became an internet sensation after it was cruelly voted the World’s Ugliest Animal. Suddenly the blobfish was everywhere. But despite its online celebrity, its deep sea habitat means that very few people outside of the marine biology community have ever seen one in the (gelatinous) flesh. Next summer we are proud to be opening the world’s first pop-up aquarium in the heart of East London. Over the past 18 months we have been working with some of the world’s top marine biologist to understand how we can safely transport and comfortably home these deep sea dwellers. And the hard work has finally paid off. We have secured our perfect venue (not easy when you need to recreate a deep ocean environment!) and work on ‘the tank’ has begun in earnest. We currently have three Blobfish all packed and ready for their London holiday – Barry, Lorcan and Lady Swift. There will be no ballot for the Blobfish Café -everyone will be welcome! Just keep your ears open for our launch in Summer 2017. How many blobfish will live at the Blobfish Café? 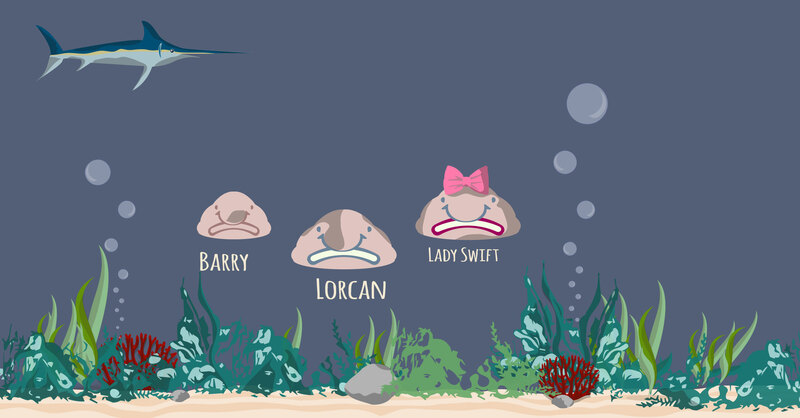 The Blobfish Café will be home to three smooth headed blobfish – Barry, Lorcan and Lady Swift. Can I touch the blobfish? Am I guaranteed to see a blobfish? Yes. Our specially designed viewing tank will ensure you will always see a blobfish during your visit. Unless they escape which seems unlikely. Will the blobfish be happy in this environment? Blobfish are never happy. But in all seriousness, every possible measure has been taken to safely transport these Australian ocean floor dwellers and happily rehome them in an East London pop-up. How will you get the blobfish to London? Who says that they aren’t already here? Transporting any deep sea fish is a serious logistical challenge. We have worked with the very best marine biology experts to make this Herculean task becomes a reality. Education, education, education. We want people to be able to look the blobfish in the eyes. Where is the blobfish café? We had initially planned for the Blobfish Café to reside on an industrial estate in North Acton. However, due to planning complications we have been forced to find an alternative venue. We are excited to announce we have secured a new venue in East London. We will reveal the exact location as soon as we have a firm opening date. The grand opening has now been delayed until Summer 2017. Building a deep sea tank is no easy task and we are well aware that construction may overrun. As soon as we have a date set in stone we will be announcing it on this website and on Lorcan’s Twitter feed. How much does it cost to visit the Blobfish Café? Is there a ballot? There is no ballot and no charge for visiting the Blobfish Café. All of our revenue will be made from selling drinks and food – meaning they will most likely be slightly overpriced. What can I expect to eat at the Blobfish Café? Expect to dine like a king! We will be working with some of London’s most talented up-and-coming chefs to put on a range of light lunches and more substantial evening meals. We will also be holding weekly gourmet nights during which we will serve a full eight course deep sea themed tasting menu. Booking will be required for these evenings – more information will be available closer to our opening. We are still in the process of obtaining our license – but we certainly hope so! There has been mention of a specialist White Russian bar….Watch this space! Can I get high at the Blobfish Café? No. Anyone found taking banned substances, poppers or other legal highs will be removed from the premises and banned for life. Will the profits you make go back to helping blobfish? Building a deep sea mega tank is not cheap. Maybe. How can I keep up-to-date with the latest Blobfish Café news? Simple! Visit this website, check out our blog and, most importantly, follow Lorcan the Blobfish on Twitter. © 2019 Blob Fish Cafe.